In exploring the origin of this innovative tech, there does not appear to be any 'one' individual credited for the creation of the Dallas robot bomb. In fact, in this specific case, it appears that this device was jerry-rigged to accomplish the task needed to take down Micah Xavier Johnson, the shooter. 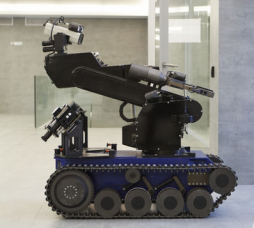 Dallas authorities did not provide details on this specific robot, but the city's emergency management inventory lists a Northrop Grumman Andros robot designed for bomb squads and the military, and some media reports said this could have been used in the killing. Northrop's website says the robot is "designed to defeat a wide range of threats including vehicle-borne improvised explosive devices." Another robot developed by China's National Defense University called AnBot was recently designed for "an important role in enhancing the country's anti-terrorism and anti-riot measures," according to its website. And yet another robot developed by California start-up Knightscope uses "advanced anomaly detection," and according to tech sources will augment security at some corporate firms and shopping malls. 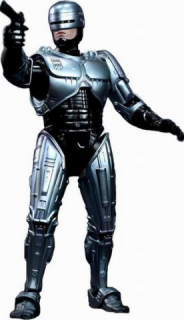 For those familiar with the RoboCop movie franchise which includes two films, which debuted in 1987 and again in 2014, it appears that humanoid robots are already in the works to join police department efforts in the very near future. Today, a real-life robocop can be found in the Silicon Valley. Standing five feet and weighing in at 300 pounds, the K5 security robot patrols the grounds of data centers in the tech region. Gathering information from sensors and cameras, its GPS technology allows it to move autonomously throughout its assigned area to report offenses to security guards and police departments. While robot developers will downplay the lethal force associated with this type of technology, those on the other side of the debate will note that since these robots lack human emotions such as empathy and judgment, police departments could become responsible for arbitrary killings in unforeseen situations. This is indeed a new frontier. The use of a robot to kill a perpetrator on American soil breaks new ground for law enforcement. There’s nothing in the annals of police code of conduct or U.S. law that specifically addresses this issue. So readers, how do you feel about the robot deployed by the Dallas police or the use by any other police department in the future? Should they include deadly force or is there some other means to incapacitate a victim? Your comments and feedback are most welcome.